This is my second CS Lewis-inspired tattoo, he's my favorite writer by a mile, and he has been for years. Lewis is best known for the Narnia books, but it was his Christian theology and philosophy that first drew me to him, and that's what I keep going back to. His writer's voice is a source of comfort to me, no matter what is going on in my life, and no matter what I think I do or don't believe at any given point. 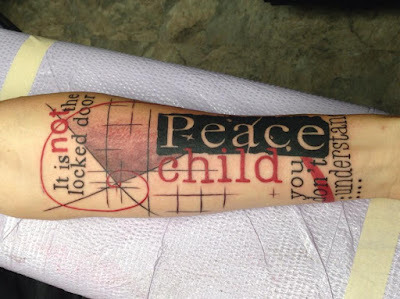 The passage referenced in my new tattoo is long, the whole passage is two paragraphs, and I'll cut and paste it below. It's a passage about Lewis's very quiet, very English faith, and I think it serves as a lynch pen to the entire body of his work. The point of the passage is to remember the very limited, very incomplete scope of human experience... and to remember that the limits set by our perception forbid both narcissism AND nihilism. That's something that I try to consider daily, and I try to use it to keep my attitude in check. I try to remember that I simply see too little of the big picture to ever get too confident. I also see far too little of the big picture to ever allow myself to indulge in pessimism. If you think about it, pessimism requires a very short-sighted, self-congratulatory kind of cockiness. In order to ever really feel that all is lost, you have to believe that you really understand things well enough to really see the limits of all possibilities. Not one of us possesses that kind of comprehension. I know that I don't, anyway, and I draw a great deal of comfort from that. Whenever I get really dark, really depressed, the thing that pulls me out of it is when I eventually realize, wait a minute ... I don't understand a damn thing. I know me, I know how little I've figured out over the years, and I know how often I am wrong. All the time! Every time I ever think I really see anything in its entirety, I soon come to realize that I don't. It seems that things always change in ways I could never have predicted. That's wonderful, and it grounds me. Even at times when my faith seems to have been tested and come up completely short, it always does me good to realize that the problem probably lies not just with my situation, but first with the very small window through which I'm viewing it. Lewis framed it in an "unanswered prayers" meditation, and that is where I always eventually go with it. Even when I'm at my lowest and cannot see God at all, I eventually remember that my inability to see the infinite is, first and foremost, an indication that I am finite. So there's my new tattoo, and the ideas and reasoning behind it. I cannot say enough good about Rob Smith at Caspian Tattoo. I've never had a tattoo artist work as hard with me as he did to design something very personal and meaningful for me. He's a heck of a nice guy and a lot of fun to talk to, and I had a good time just hanging out with him and watching Bob's Burgers while he applied my ink. If you're anywhere near Lynchburg, Virginia, and you're looking for a great artist to do some tattooing for you, Caspian Tattoo is the place and Rob Smith is the man.